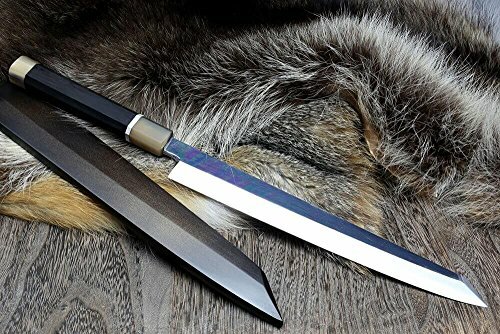 The Yanagi is a long slicing knife that was designed to slice thin slices of fish for sushi and sashimi, and is one of the most essential of traditional Japanese knives and is a powerful component in the repertoire of many chefs. The beauty of its elegant thin blade is its ability to slice through an ingredient in long uninterrupted strokes, preserving its integrity and freshness. The Yanagi Kiritsuke is slightly heavier with a with a blade that is wider and a spine that is thicker. The sword tip helps balance the weight of the knife and is recommended for chefs who are interested in a Yanagi but have a smaller working space. Even the simplest of tasks are elevated with a handcrafted knife that is as beautiful as it is functional. Our handmade Yoshihiro VG-10 Semi-Stainless Steel knives With its single-edged blade, this chef's knife, made of VG-10, thinly slices through the skin and flesh of a fish with ease and without compromising the taste and quality of the structure-unlike other knives which can damage the cell walls and alter the feel and taste. Traditional yanagi kiritsuke knives leave the fish smooth, shiny, and fresh. This special forged knife is a higher-quality knife is forged by layering softer steel over a hard VG-10 Stainless steel core. The hard steel of the VG-10 allows for a superior sharpness and edge retention while the softer, surrounding steel adds durability.